The spirit of Samoan Culture is highlighted in all aspects of Tisa’s warm hospitality; from welcoming visitors, to engaging in a revival of cultural arts. Founder Tisa has become an advocate of all things Samoan, including the natural history of her village and island home. Alega, home of the Barefoot Bar, was a busy little village in Stone Age Times. Manufacturing of stone tools was the big production and trade in the 14th century on Tutuila Island. Today remnants of this history are found on our beach where you may join the Stone Tools hunt. Book in for an unforgettable Samoan dining experience at Tisa’s. 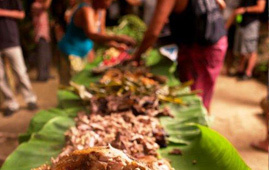 It is highly recommended that you engage in this family-oriented culture of American Samoans where everyone is offered a seat at the Samoan Feast. Traditional Tattooing and Samoan Cultural arts are celebrated annually in the last weekend of October. Po Ula Friday is an ancient event celebrated at Tisa’s. It is worth staying overnight to greet the sunrise with an organic breakfast.